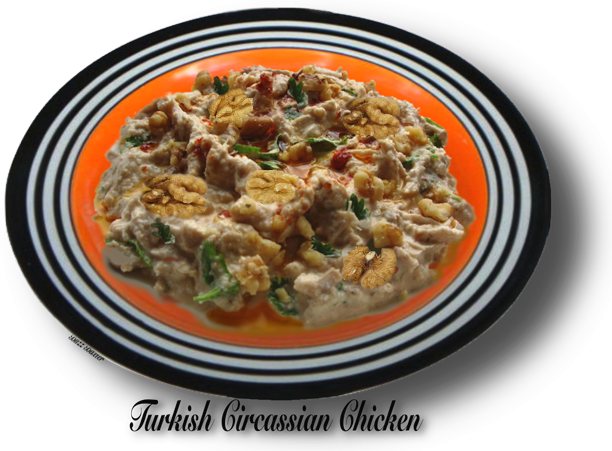 A Turkish chicken served cold in paprika and a delightful walnut sauce. Coming to you right out of the Ottoman Empire. Turkey is a delightful country for great food. A mix of Mediterranean, Arabic and the Near East. Their dishes are a bit Greek, a bit Armenian, a bit Lebanese and a bit Persian. Of course all these countries are neighbors and at one time or another were conquered by the Turks or they conquered the Turks. But, we are talking food here, and it is the country to enjoy good food to be sure. and shred. Strain chicken stock and reserve. paprika. Leave this mixture on a warm spot on the stove. over top. Decorate with walnut halves and paprika oil. the cayenne,  unless you like the burn.